Komodo Liveaboards are a great way to dive and explorer the Komodo islands. Komodo Islands lies at the eastern tip of the Indonesian archipelago. Immediately to its east, you’ll find the much bigger island of Flores. 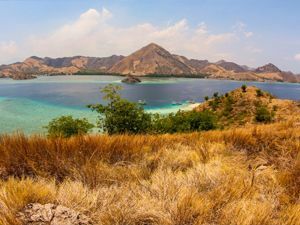 On the west coast of Flores lies the small town of Labuan Bajo, the main gateway to the wonderful Komodo National Park. While there is a harbor in Labuan Bajo with some ferries stopping over from other Indonesian islands, the main route into it is via Labuan Bajo International Airport. There are plenty of flights on a daily basis arriving from multiple destinations. There are two best times of the year to visit Komodo National Park. The best periods to visit are from April to June and from September to November, although the high season actually runs from April to November, it’s the opposite of the Similan islands season. During those two time periods the place is not overcrowded and the diving is at its best with plenty of interesting stuff in the water, including mantas. The area of Komodo suitable for diving is very large. From Labuan Bajo, the park can be divided into a southern and northern diving area. The key difference is access! The norther dive sites are near enough to be able to be accessed by day boat from Labuan Bajo. The southern dive sites are a little too farther out, and can only be reached by taking a Komodo liveaboard trip. The northern dive sites of Komodo are spectacular and every bit as good as their southern counterparts. Some the best are Manta point, Batu Bolong, the Cauldron, and Castle rock. Manta point is exactly what it sounds like, a spot visited by plenty of mantas. This long shallow plateau is about a mile long, and in the right season has plenty of manta rays travelling up and down while feeding in the current. It is relatively shallow with a maximum depth of around 12 meters. The Cauldron is another great bowl shaped dive site with plenty of marine life and coral reefs to enjoy. Castle rock is an outlying reef with a small plateau on one side at around 22 meters. Thanks to its strong current hitting the reef head on and splitting to either side, this plateau is a great location to just stay put and watch the thousands of fusiliers and Jacks hovering in the current, while lots of White tip reef sharks dart in and out of the clouds of fish. The southern dive sites are less visited than the northern ones and are truly spectacular. Some of the most amazing are Manta alley, End of the world, and Langkoi rock. Manta alley is similar to manta point, a long shallow path that has tons of visiting Mantas. The dive site known as End of the world is the most southern dive site in Komodo, it is a 40-meter deep wall of rocks with absolutely pristine untouched reefs and tons of overhangs and caves. The marine life is rich and diverse with plenty of White tip sharks, morays and rays. Langkoi rock is simply put crazy! It is the best dive site to encounter sharks in Komodo. This small pinnacle is home to a healthy population of all kinds of sharks. You have a great chance of encountering Hammerheads, Bronze whaler, White tips, Silvertips, Blacktips, and even the odd Leopard shark. The currents here are extremely strong and can reach up to 8 knots, this is not a dive site for the faint-hearted. Before you head off home, don’t forget the dragons, you have after all probably traveled a fair distance to come here so it is worth the detour. While there are several trips available to Komodo and such, the more committed divers can still fit them in without losing out on too much diving. Most northern dive operators offer the option for divers to swap on of the afternoon dives with a visit to Rinca Island to see the dragons. This is a great option to combine a day’s diving and seeing the dragons rolled into one. 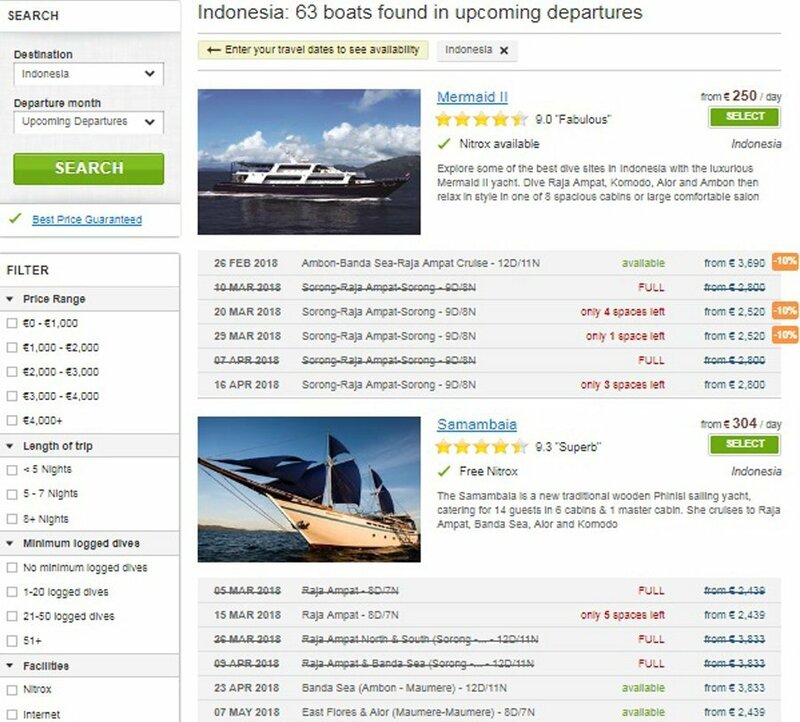 I can’t quite seem to find flights to Labuan Bajo? That is not a surprise, although the airport is called the Labuan Bajo International airport, there are no international flights that fly to it – yet. All flights into Labuan Bajo arrive from domestic routes inside Indonesia. The vast majority arrive from Denpasar airport on the island of Bali. If you search for flights from Bali there are plenty to be had, and there are many low cost options available such as AirAsia, Wings, and Lion air, on top of the Indonesian national carrier Garuda. Be careful when booking since most of the low cost carriers do not include a checked luggage allowance, and often booking with a slightly more expensive carrier that offers a checked luggage allowance is cheaper in the long run. Rinca? I thought Komodo dragons only lived on Komodo? That is a common misconception, but the dragons are actually found on five Indonesian islands: Komodo, Flores, Padar, Rinca, and Gili Motang. The largest population is on the island of Komodo, which is where the dragons get their name from. In addition, the dragons on Komodo tend to grow larger than the ones on the other islands due to the abundance of prey and habitat. Rinca Island shelters the second largest population, and the dragons do reach an impressive size. What about travelling in July and August? While this time period is high season, it is also the peak of the touristic season. The weather is hot and humid, the hotels and resorts are absolutely packed, and there are tourists everywhere. In terms of sightseeing during this time of year, there is a reduced chances of encountering dragons since it is mating season and the dragons wander off and are otherwise occupied. In addition, the sea can be a bit rough with more wind. Furthermore, as a diver this is not manta season, so while you may see the odd manta if you are lucky, the chances of encounters are somewhat limited. Why are the currents so strong? The currents are due to the particular location of Komodo and Rinca islands, which act as a funnel between the Indian and Pacific oceans. This bottleneck or funneling effect creates stronger currents, as the waters rush through a confined space. On the positive side, despite the currents being strong, with some care you can really enjoy the diving. After all, it’s the presence of these currents that bring the nutrients and promote the growth of the amazing local wildlife. They also create the wonderful clarity of the water as the current keeps sweeping away particles, keeping the visibility good. To non-divers the small Indonesian island of Komodo is world famous for its dragons. For divers however, the fame of Komodo is greater since it is also home to some utterly world class diving. While nearby Raja Ampat gains all the plaudits of arguably the best place to dive in the world, Komodo is far from just a place where dragons hang out. When we talk about diving Komodo, divers are generally not only talking about sites around Komodo island, but about the area of the Komodo National Park, which encompasses Komodo island and several nearby islands. The main gateway to Komodo National Park is via the town of Labuan Bajo on the western coast of the island of Flores. The main access to Komodo is via the nearby town of Labuan Bajo on the island of Flores. Labuan Bajo is the capital of the regency MangarraI Barat, which is the most westerly point of Flores island. Labuan Bajo airport LBJ is the main gateway to Komodo and the nearby islands. The main national carrier of Indonesia is Garuda Indonesia. The airline’s major international hub is at its headquarters in Jakarta, at Soekarno-Hatta International Airport (CGK). The airline serves most of the country domestically, as well as running an international service to and around Southeast Asia, and to a couple of European destinations. The island of Komodo lies to the east of the chain of islands that form Indonesia, and the time difference is UTC/GMT +8:00. Like the rest of Indonesia, the supply of electricity in Komodo is 230 volts at 50 Hz cycles. European travellers should have no problems since the bulk of sockets and prongs are of the two-pronged variety common in Europe. If you are coming from a country running 110-volt electricity you will need to bring a converter with you. The power supply is reasonably reliable and while power outages and surges do happen they are relatively rare. The main currency in Indonesia is the Indonesian Rupiah IDR; the current conversion rates are 1 USD= 13,616 IDR and 1 Euro= 16,890 IDR. Obtaining cash is relatively straightforward, and there are plenty of banks with ATMs, especially in the main town of Labuan Bajo. It is also relatively easy to change USD/EUR/AUD into the local currency. The main town of Labuan Bajo which is the gateway to Komodo has a relatively small population of around 2,000 to 3,000 people. Although during the tourist season that number swells several times over. While the island of Flores has people of several ethnicities, western Flores is almost entirely populated by the Manggarai people. The main language spoken in Labuan Bajo is Indonesian or Bahasa, which has its roots in Malay. English is relatively wide-spoken in the town especially in the main touristic establishments like dive centres and restaurants. If you head off the beaten track a little, then you may find it more difficult to communicate. Although Indonesia is the most populous Muslim country on earth, various of its islands have their own religious beliefs, and Komodo is no different. Labuan Bajo on the island of Flores is almost entirely catholic, and the island represents an invisible border, as Catholicism expanded in the Pacific, and Islam spread from the west. While today there is peaceful co-existence amongst the different religions, in the past there has been bouts of sectarian violence. Medical care in Labuan Bajo is pretty limited and expensive. There are a couple of pharmacies for simple ailments, and there is a newly opened hospital (the Siloam hospital). For any major incident it is always best to have insurance that will cover your evacuation to a more advanced medical facility. Simply put, diving insurance is a must when visiting Komodo. There is no recompression chamber available on site, the nearest ones being on the island of Bali or of Makassar, Sulawesi. Combine the remoteness of Komodo with difficult diving conditions (strong currents and depth) and you are best served holding comprehensive diving insurance in case anything happens. Komodo has a tropical climate with 2 seasons; wet and dry. The monsoon or rainy season runs from December through April, during which there is a lot of rain and the weather tends to be hot and humid. May to November is the dry season when the climate can be very dry and arid. During the peak summer months temperatures can soar and hit over 40C/100F. The wind during the monsoon is generally from the west and northwest, while during the rest of the year it can arrive from any direction depending on the conditions that day. You can not fly into Komodo directly from outside of Indonesia. To get there you will have to connect at another major international airport in Indonesia. The most common airports to connect to are either Denpasar, in Bali, or in Jakarta. The main airlines serving Komodo are Garuda Indonesia, Lion Air, Wings Air, and some other low-cost carriers. Once at Labuan Bajo, the town is relatively small enough that if you like walking you can pretty much get everywhere on foot. However, there are also lots of local taxis that you can use. If you want to visit some of the nearby waterfalls and sites you can hire a small motorbike, although be aware that traffic and road safety in Indonesia can leave a lot to be desired, especially if you are not used to driving in these conditions. Lying in the coral triangle, the marine life in the waters of Komodo is rich and diverse. Thanks to strong currents there are plenty of big fish including mantas that can be found in abundance when diving Manta Alley. Whitetip reef sharks are also a regular sighting. You can also encounter blacktip reef sharks, grey reef sharks, and the odd hammerhead. Soft corals are found in abundance at most dive sites and act as hosts to hundreds of species. 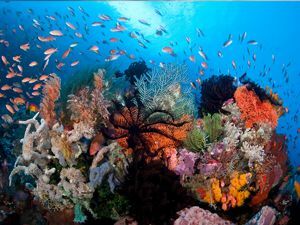 Overall there are almost 300 types of coral, 70 different types of sponges, and more than 1,000 fish species. 14 species of whales can also be found in the waters around Komodo, although they tend to be pelagic and are generally not encountered by divers. Not surprisingly, mantas are on offer here, and they are plentiful. Some days, there are even over 100 mantas at this site. This long shallow drop-off with a maximum depth of 7 to 10 metres is the perfect site to slowly drift in the current and observe mantas as they cruise the shallows. Thanks to the shallowness of the site, you can enjoy long dives with these magnificent creatures. Apart from the mantas the site is very rocky with a tiny coral reef at the start of the dive and a small one at the corner at the end of the dive. Arguably one of the best dive sites in Komodo National Park, this pristine dive site has so much to offer. The shallows are densely populated by corals and hundreds of smaller reef fish and critters. As you descend deeper along the steep walls you start to encounter some bigger species including whitetip reef sharks, napoleon wrasses, and giant trevallies. Casting an eye out into the blue you often can see dogtooth tunas, and huge schools of rainbow runners hanging in the blue. Another Komodo favourite, this site which is prone to strong currents, offers a great mix of big and small. At depth at the start of the dive you can encounter jacks, barracudas, mackerels and batfish. As you come shallower there are plenty of soft corals and gorgonians. At this point it is always a good idea to have a close look at the fan corals to try and spot some of the resident pygmy seahorses of the area. A well-known drift dive in Komodo National Park, the Cauldron can have very strong currents and is best dived just before slack water. The dive itself is a drift on a sloping reef that then opens up into a channel where the current then starts to pick up. You can encounter turtles on a regular basis on the earlier part of the dive, while later on in the channel you can encounter sharks, schooling batfish, and a host of other species including Bumphead parrot fish. If colours and tiny critters are your thing, then you can dive no other place like Invertebrate Wall in Komodo National Park. The site is populated with huge numbers of tunicates, spanish dancers, and a large variety of crustaceans inhabit all the crevices and holes in the reef wall. The amount of soft coral is huge, and the variety of colour will leave you speechless. Turtles, catsharks, and parrot fish can also be found at the site. Diving the site at night can also produce some awesome encounters with decorator crabs, slipper lobsters, and cleaner shrimps. Siaba Kecil is famed for its mandarin fish and turtles. This shallow dive which ranges in depth from 8 to 20 metres with strong currents is one of the best places to encounter turtles as you cruise along the pristine hard corals. Along the reef you will also find plenty of caves that are inhabited by sweetlips and angel fish. Don’t forget to keep an eye in the channel next to you, where you can see some huge giant trevallies passing by. Komodo is famed for its strong currents so if you are going to dive it, you need to be 100% comfortable drift diving in currents. Make sure you are well versed in the procedures and techniques of drift diving, including the use of SMBs and reef hooks. One thing you may also need to be familiar with is negative entries, since quite often due to the surface current it is safer to enter the water and descend immediately. Near the end of dives, you may find yourself regularly performing mid water drifting safety stops with an SMB so it’s is a good idea to practice these beforehand. The best time to visit Komodo is from March through to October, which is during the dry season. While during this time you will encounter mantas, they are not at their most abundant. 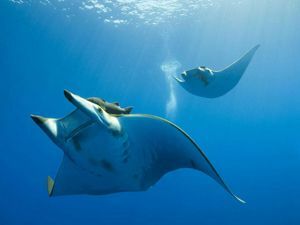 The best time for mantas is during the rainy season from December to February. While the manta numbers are at their highest, conditions can be a little rough. Also during this time quite a few dive operators choose not to operate or will run a restricted schedule, so it is always best to check before you go. If you travel all the way to Komodo then there is no excuse not to see the world’s largest lizard: the Komodo dragon. Contrary to its name the Komodo dragon can be found on 5 islands: Komodo, Rinca, Flores, Gili Motang, and Padar. 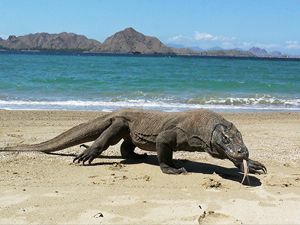 And while the largest population with the largest individuals is to be found on the island of Komodo, you don’t necessarily need to visit there to see the dragons. There is a substantial population on the reserve of Rinca island, and a visit to the dragons can often be combined with a day’s diving. A few operators run a day trip where you do two dives in the morning, before heading to Rinca in the afternoon for a visit to the dragons. Around Labuan Bajo there are also plenty of opportunities to go jungle trekking and visit some stunning waterfalls. 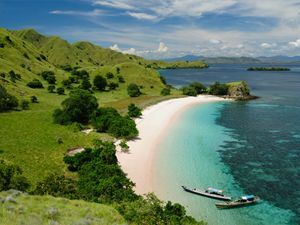 Visiting Komodo and Labuan Bajo is a great chance to experience unspoilt nature including Padar island, and Pink beach. Komodo is one of those places that should be on every diver’s bucket list. It is a great chilled out place that will remind older divers of how some of the world’s great dive destinations used to be twenty or thirty years ago. The sea and town are still relatively unspoilt by the effects of mass tourism, although that is changing over time as it becomes an ever more popular destination. So if you are thinking of your next dive trip why not give Komodo a serious thought? Great dive experience, highly recommended!